Refresh My Soul This Sunday! I pray you find time today to rest in the chaos and refresh your soul! God awaits your presence and he desires your friendship. Sit with Him today. Aren’t Easter Egg Hunt’s fun? Are you looking to go all out with your family this year? Maybe you are struggling to find a way to make sure Jesus is the focus of your Easter? I think I’ve got an idea for you. 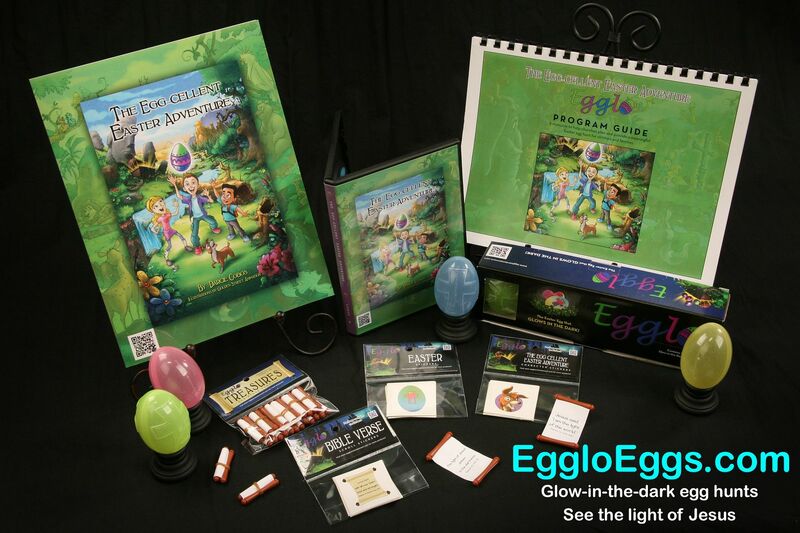 My family recently had the opportunity to review Glow in the Dark Egglo Eggs by Egglo Entertainment. The Egg-cellent Easter Adventure Program Guide ($14.99). The ideal age range for these products is 4-13. My 3 children range are currently 8, 6, and 3 years old. The eggs themselves come as a set of 12 in a great cardboard storage box. Like most things that glow in the dark they do need to spend some time in the sunlight in order to charge up and glow. We set them out in a window ledge for most of the day. The eggs are of good quality. They come in nice pastel colors. Some have crosses on them. My children loved playing with them and they held up well to little hands opening and closing them often. 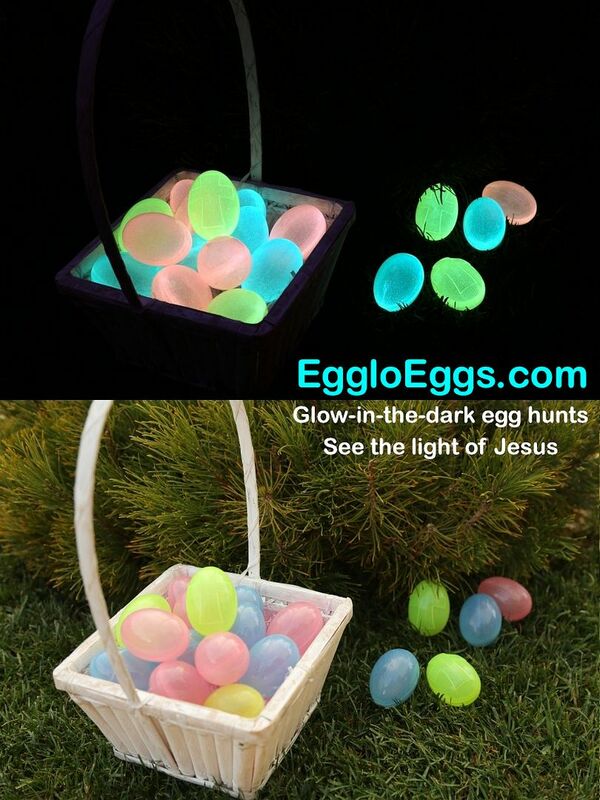 They glowed fairly well. I wasn’t overwhelmed by their brightness but it was good enough. I took the photo below with a very slow shutter speed in an nearly pitch black room. The Egg-cellent Easter Adventure book is a great book for children. It is of high quality with a sturdy cover and pages. The illustrations are well done and engaging. The story is about two cousins who find a magnificent Easter egg in an attic. The egg transports them on an adventurous treasure hunt. Throughout the books they use scripture and clues in scrolls to help them along to the next destination. 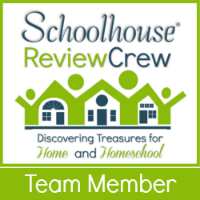 Included are character lessons that lead to great topics of discussion for you and your children. The journey ends at the foot of the cross. All of my children adored this book. It became the sought after book for our reading time. Each of my boys reread it countless times. Joyanna, my 3 year old, would flip through the pages again and again. She event talked her brothers into reading it to her a few times. There is quite a bit of text in this book and I do feel it’d keep the attention of even older children. In our family we are tremendous fans of audiobooks. 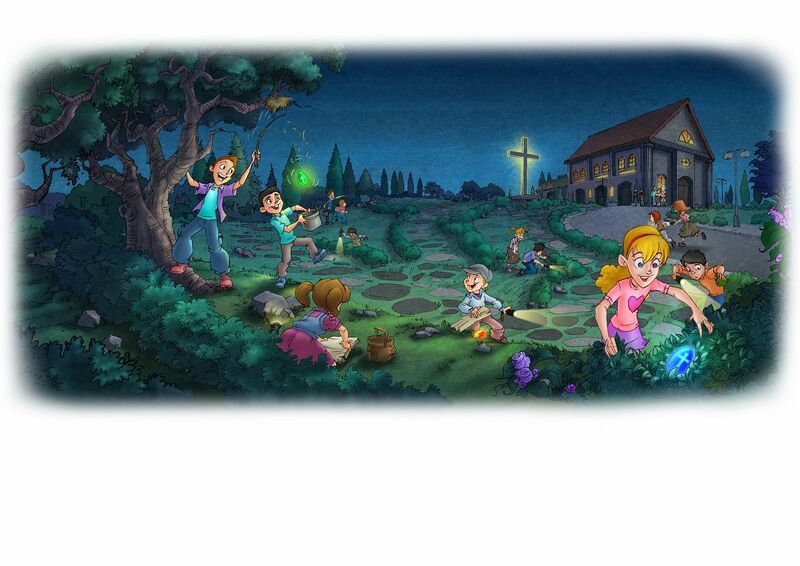 We were delighted to receive access to The Egg-cellent Easter Adventure (book audio download). The voice narrating the story is comfortable to listen too and easy to follow with the pages of the book. He’s fun and entertaining adding a great deal of depth to the story. One listen will take about 30 minutes of your time. The program guide is a fabulous resource and a must have! Inside the pages you’ll find snack ideas, game ideas, questions for the Egg-cellent Adventure book, print-outs to decorate your church or home and some fantastic coloring pages. If you decide to hold a hunt with your church you’ll be delighted to find posters and invitations ready for printing. Our family enjoyed the coloring pages. We even cut several eggs and tied them with string to add a festive feel to our egg hunt. Speaking of egg hunt! It was a great thrill! Wandering around the house in the dark using our eyes to hunt for glowing eggs was such a fun and unusual treat! They even got to stay up a little later than normal in order to have the hunt. How fun is that!?! We filled each egg with one of the Egglo Treasures Scripture Scrolls. After all of the eggs were found we sat together and read each of the scriptures from the scripture scrolls. Then we discussed how these scriptures show us that Jesus is the true light of the world. We really enjoyed our time with the Egglo Eggs and the Egg-cellent Easter Adventure book. These were fantastic tools for driving home the good news of Jesus and our hope and light in the world. I’m going to box up these supplies and make sure we keep them safe. I’d like to use them again every year as a new tradition in our home. If you’d like to learn more about Egglo Entertainment you can visit their website or find them on their various social media websites. Growing in the Word…Curb the Crazy Quarreling! Am I the only one with kids who argue seemingly ALL OF THE TIME? I can’t be the only Momma out there who wants to bash her head into a brick wall because I’ve said… “STOP THE FIGHTING!” too many times in one day! Is it a wonder my gray hair is starting to show? It can be crazier than a circus around here at times. My 3 children swing wildly from getting along perfectly to screaming at each other over the most trivial things, to ANTAGONIZING one another just to get a reaction. Sometimes there isn’t enough Tylenol in the world to curb my heachaches after referring yet another ridiculous fallout. I’ve tried many tactics… separating them (and me), timeout, explaining, ignoring them to let them sort things out themselves and in my desperate moments even begging and pleading with them to KNOCK IT OFF! While we may are blessed with sometimes week long seasons of calm and togetherness, nothing truly seemed to stick for the long haul. Where was I going wrong? Then it hit me like a ton of bricks! I was asking my children to stop what is truly a natural, though unhelpful behavior, all on their own with just their own strength and willpower. One lesson that I have learned is that changing yourself in that way rarely works… especially is you are still a child. We needed help! Thankfully God provides. I gathered my children and we opened our Child Training Bible to see what God has to say about all of this quarreling. First we talked about the quarreling and how it made us all feel. I was amazed as my kids confessed that they really don’t like to fight and it makes them pretty sad. Then we prayed to God and asked Him to help us figure out how to stop the madness! Finally we turned to the scriptures. As I read each one I stopped and asked them to help me figure out what God was trying to tell us and I did my best to provide our real life examples of where we are going wrong according to that scripture. We brainstormed better ways to deal with the situation and we even acted them out with one another to practice. Most humbling of all… I shared examples with them of times that I get into quarrels with their Daddy or others. I’m far from perfect. I struggle with things like this much as they do. I believe this makes them feel less condemned and more understood. My guys are all 8 and under. They are incredibly fidgety. That’s ok with me. I let them flop on the floor, handle little Legos, or even doodle while we chatted. They really pay attention during these talks, which ALWAYS amazes me. I do my best to cut it short before they lose attention. At last we hit upon the scripture that spoke to us all the most. They all agreed most of the arguments are foolish and stupid. Their eyes popped when they learned the Lord says that we must not be quarrelsome but kind to everyone. It was an AH HA moment for them and for Mommy too. We prayed together and asked God to send his helper the Holy Spirit to help us when quarrels erupt. We declared 2 Timothy 2:23-24 our memory verse for the week. We copied it down on paper every day and recited it whenever we thought to. Whenever it seems we need a reminder, we come back to this topic… reread our scriptures and discuss how things are going… where we succeed and where we fall short. Now, when quarrels flare up I just asked them if this is a foolish argument and inevitably they agree that it is. Then I ask them what we could do to handle this better. That is usually the end of it. The level of arguing in our house has decreased significantly. There is a new peace and calmness that I think everyone enjoys. I know I certainly do. I am reminded of Philippians 4:13 I can do all this through him who gives me strength. My children need God’s help to change as much as I do. It is my job to point them to Him. When I Do It ALL and ALL Is NOT Enough! I’m a mom and like all moms I bust my rear end day in and day out to give my children every opportunity in this world. Sometimes that means we get to do great exciting things, sometimes that means I lay down expectations and consequences. But mostly in means that my work just never ends. Somedays, ok… most days, I wind up just exhausted. Field trip days. Field trips are absolutely exhausting! Field trips have to be planned, lunches have to be packed, the van has to be gassed up. All day long I have to watch out for safety, bring out the best of the best of the place for educational purposes, I have to haul stuff, walk far, settle disputes, and generally keep everyone going and happy. So why is it the minute we get home and I just want to collapse in exhaustion that my children cry because we are staying home for the night, or because I won’t read them a book, or because I won’t start a craft project. I gave them ALL of my all day and it still wasn’t enough? How about the…. YOU NEVER! You know, when your child claims you NEVER take them anywhere, play with them, read to them, or for goodness sakes FEED them. Yet you can rattle off 20 times you did just that thing in the last 3 days. Doesn’t that just make you feel ever so unappreciated? It makes me want to scream! Or my favorite… as a fun change of pace I decided we should take an afternoon at the park, or at the Y to swim, or at a playdate. I figure it’ll help us all focus better if we get some time away and some new scenery. Then when it is time to come back together, perhaps the next day, to get some work done and my children pitch a FLIT! Sometimes they even have the audacity to claim they need a BREAK! Can you see me bashing my head against the wall here? Please dear God do NOT let me be the only one who has EVER felt this way! I believe my children are generally respectful and well behaved yet all of the above sometimes makes me wonder. I have no answers for any of these things. Really I think it is just a maturity thing. My children are children and they will behave as such. I do honestly tell them how they make me feel at these times. I pray over time that will help but for now, I will lean on this verse. I am doing the Lord’s work as I raise my children. When the time comes I am confident that He will reward me for it. Praise God for that! Someone please raise their hand, stand up and shout, and let me know that I am NOT alone in my struggle with prayer! I am just convinced I can’t be the only one! Let me know if this sounds like you. You sit down with a cup of tea (or coffee), perhaps a journal or an app on your device that lists the things I earnestly want to pray for. You have a whole set up in mind that includes a desire to praise God for His glory, to thank Him for his blessings, a time to confess your heart, and even time for the… PLEASE DEAR GOD HELP ME! It all is well and good intentioned. So you find a cozy spot free of distractions and you fold your hands, or lift them or… whatever you do. You start off… Oh God in Heaven I want to lift your name in praise and worship as you are the most Holy. Or something similar and then you’re all like… geeze I need to use the bathroom! And then on your way back you figure you outta toss the laundry in. Ok… back to prayer…. where was I? Oh yes, I praise you Jesus… hmm… my coffee is empty I better go fill it up. Ok, so HOPEFULLY this is a BIT of an exaggeration. Or maybe it isn’t. I don’t know. But I do know this. I am SO STINKING distractible when it comes to praying that I end up feeling ashamed and I mostly give up before I really get started! I begging you all to let me know I’m not alone in this! Can I confess? It gets worse after God decides NOT to answer a prayer that I begged for with all of my heart. My goodness I am like a child! I don’t get my way so I walk off and do my own thing. Pouting probably too! God help me! Then I feel guilty. Next my brain convinces me that I’m just such a mess up so I had best just not bother praying at all because why on earth would God even want to listen to me in such a sorry state. I have had to hide this verse in my heart as it is my motivation to keep coming back to God time again, no matter what a sorry mess I am. God wants our hearts no matter what. So this is a reminder to myself and to you, that even if you consider yourself a prayer failure much like I feel I am, pull yourself up and go back to God. He wants us no matter our messiness. Growing in the Word: Teaching My Children Compassion! I have three wonderful kids who are, generally speaking as kids go, thoughtful and behaved not only with each other but with those in the world. I am doing my darndest to promote a spirit of servitude around here. They do like to help with chores. They enjoy doing things like bringing Mommy tea in the morning. They often surprise me by just helping either me or each other. I see it most when out in the world. They all definitely watch out for one another. I have even been told stories by teachers or instructors about one son stepping in stop a bully going after his brother or to make sure his sister has what she needs when she isn’t with Mommy. These things make my heart grow! But it is not always this way. It is far from perfect by any stretch of my imagination. Here is something that bothers me. Please tell me this happens in your house and that I’m not alone. I see this a lot, especially when we are at home. One child can fall and bump or otherwise hurt themselves… bleeding even… and another child will just step over them like they aren’t even there. Once child can be struggling to handle a big load of laundry or a large container of toys and the other will ignore it like nothing is going on. I’m not sure if they think that Mommy is around so I’ll provide all of the help, encouragement, and compassion or what. Instances like these can leave my blood boiling. I firmly believe that we practice at home those character qualities we want to have in the world. You cannot be loving and compassionate with others if you are not loving and compassionate with those closest to you. Today marks the 12th anniversary since the attacks on the World Trade Center. Those attackers showed no mercy to anyone but the days that followed showed that we are a nation that can pour out compassion on one another. As I reflect on that I feel a burning in my heart to pour the teachings of compassion from God’s word into my children all the more. I believe we as Christians are called to pour the love of Christ into this world and understanding compassion is the first ingredient. There are so so so many instances in the Bible where God reveals His compassion for us. After all, He was so compassionate about our plight in this world and beyond that He sent his only son to die for us a horrible death. To the punishment for our sins. In the coming weeks I am going to use this space to explore what God has to say about compassion in His word. I’m going to leave you with a Psalm… 103:13-18. A reminder of God’s heart for US.